Roots 2 Blossoms : What's in a name? I started with Instagram, since it is fast easy and really a picture says a thousand words. But what name? First of all to understand the name Roots 2 Blossoms you have to know the purpose of sharing family history stories. They go hand in hand. For me as I have heard stories of my ancestors it has changed my perspective and truly changed my life. 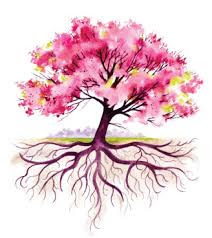 Through our roots we can all blossom. So I hope to help others grow and blossom too as they read stories of the past and learn to love family history.